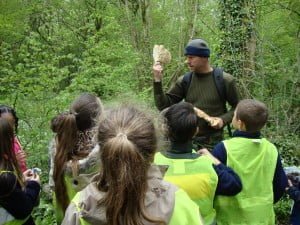 Steve talks fungus at Leafy Murdery Mystery! Did you come along to the Leafy Murder Mystery last weekend at Stoke Park? Did it whet your appetite for the wild woods and leave you hungry for more? Or did you miss out? Worry not! Local wildlife celebrity and Evening Post columnist Steve England will be strutting his stuff in Stoke Park again, this time for ‘Hidden Worlds’ which takes place next Wednesday 29th May from 11am – 3pm. So what sort of surprises can you expect next Wednesday? Well, you might get the chance to see a rat tailed maggot (yuk!) that lives in an environment so dank and smelly, most other creatures wouldn’t survive. This beastie actually uses a snorkel to breathe clean air! Then there’s the secret world of tree beetles, beetles beavering away under tree bark, eating the tree from the inside out! There are birds nests galore, harbouring precious babies, cleverly concealed from predators, and mysterious underground fungi, whose acres of roots support entire tree systems with water and nutrients. That’s just a snippet of what you can expect to find out about! The event takes the format of 2 sessions, starting from the Cameron Centre, Cameron Walk, Lockleaze, Bristol, BS7 9XB, one starting at 11.00 and the second at 1.15pm. Each session includes a woodland walk, followed by a lab with microscopes, outside in Steve’s forest campsite! Lunch will be from 12.45 to 1.15, and you are free to bring a picnic and stay after the morning session or arrive early for the afternoon to enjoy dining al fresco! This entry was posted in Bristol99 Project, Events, News and tagged Bristol99, Events, Hidden Worlds, Leafy Murder Mystery. Bookmark the permalink. ← Leafy Murder Mystery – Steve England and Katie Tomlinson prove anyone can be a successful plant detective!